Scenes from the Bushwick community planning process. A proposal is expected in September. After almost four years at the task, the Bushwick steering committee for rezoning and its supporters are preparing a framework plan to be debuted this September while facing protests from activists concerned about displacement and unaffordable housing in predominantly low-income communities. 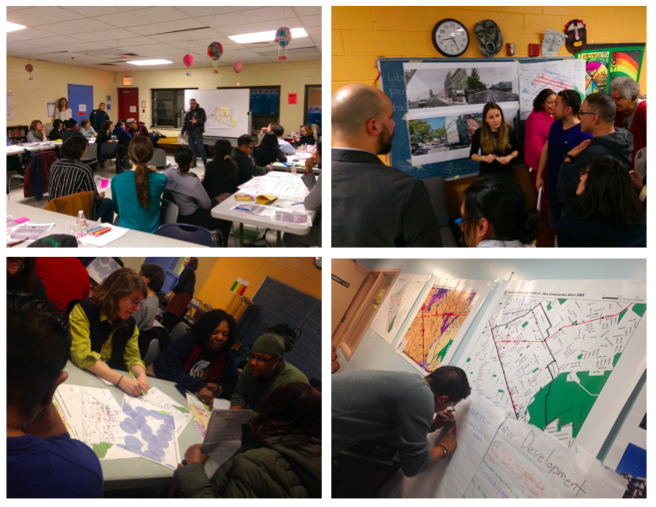 The Bushwick steering committee is comprised of dozens of residents and members from nonprofit community organizations which receives technical support from city agencies such as the Department of City Planning, Department of Housing Preservation and Development and Department of Buildings during their planning process. Their work is a collaborative rezoning plan also known as the Bushwick Community Plan. The steering committee is deliberating the contextual downzoning of side streets; a higher density rezoning of “transit corridors” like Broadway, Myrtle, and Wyckoff avenues; and a modest upzoning of avenues like Central, Irving, Wilson, and parts of Bushwick and Knickerbocker. The steering committee would like Bushwick Avenue to be designated as a “historic” corridor and would like to see Knickerbocker remain “mixed-use” in the plan. Additionally, the current draft recommendations include looking at allowing non-profits to develop public sites with rent-restricted housing, deeper affordability levels than mandatory inclusionary housing requirements, tax abatements for even deeper affordability, instituting a “flip fee” on speculators and creating a tax credit program for landlords of small homes, among other measures. But steering committee members say there is much more to discuss and further need to evaluate what deeply affordable housing could look like in Bushwick. Fennell says another important goal that could wind up on the table is a study on the racial impact of rezonings. “We have asked for this, but the city has refused to do a study in the past and we will see what happens,” she says. In June, the steering committee attempted to present some of their ideas to Community Board 4 but were disrupted by the Mi Casa No Es Su Casa, G-REBLS and The Brooklyn Anti-Gentrification Network (BAN) to protest against the possible rezoning, which the protesters felt would lead to the displacement of the long-time residents of the area. One catalyst for the June disruption was a heated debate that took place during a Bushwick steering committee in February. “We started to talk to residents and realized that they did not like what was happening in their neighborhood. And they did not want it,” says Malik Clarke, Bushwick resident and organizer for G-REBLS, who led the disruption at the Community Board 4 meeting. Clarke says he also sat on the steering committee in February and felt that questions such as, “Who was this for? And how does the public’s voice count?,” were not being answered, “In that meeting, we did not feel like the city was there to help us,” he says. Councilmembers Antonio Reynoso and Rafael Espinal coordinated the Bushwick steering committee to bring forth a plan from the community to meet several goals, including deeply affordable housing, transportation improvements and tenant and small business protections. Reynoso and Espinal, both sympathetic to the protestors, are waiting out the results of the community engagement in the rezoning process. Espinal’s office says displacement prevention and how to develop new affordable housing while protecting existing tenants remain important issues. Some of the protests in the neighborhood are about what’s happening already—before any rezoning occurs. Churches United For Fair Housing, which has members in the Bushwick steering committee, has also been rallying to bring attention to speculative investments, out-of-character development and unaffordable housing already on the ground in Bushwick. Over the past month, CUFFH has protested outside of 17 residential developments and proposed developments that they say are unaffordable for the Bushwick community, culminating Tuesday outside of large supermarket and parking lot on a Wyckoff Avenue. The property is slated to become a commercial and residential 27-story building, according to the nonprofit. The final rally on Tuesday was attended by teens from the Bushwick area, Reynoso and state Senate candidate Julia Salazar and new Community Board 4 chairperson Robert Comacho. The Bushwick Community Plan rezoning proposal is expected to be presented to the public in September. If the proposal garners the support of the local Council members and de Blasio administration, then it will begin moving through the environmental review process and the Uniform Land Use Review Procedure (ULURP) through which rezonings are approved, amended or rejected. So far, the de Blasio administration—which has said it would tap 15 communities for area-wide rezonings and has identified 11 of those—has rezoned East New York, Downtown Far Rockaway, East Harlem and Jerome Avenue with Inwood likely to follow with a Council vote later this week. Bushwick could move into the ULURP pipeline in 2019 along with Gowanus, another area where the Council and a community process led the way. The possible rezonings of Long Island City, Bay Street on Staten Island and Southern Boulevard remain on the table, as does discussion about whether to rezone portions of Chinatown and the Two Bridges area. A proposed rezoning of Flushing was halted two years ago. Tenants in illegal basement and cellar apartments typically have no lease and limited rights while living in substandard conditions.